Nourishing our spiritual health through an appreciation of Krsna’s miracle in milk. Milk has been famous as a storehouse of nutrients since long before the health-oriented 1980’s began. Didn’t your mother tell you that the minerals in milk help build strong bones and teeth? In recent years, milk’s status as a healthful beverage has been fortified, as more information about the value of its constituents has become known. That ubiquitous drink contains protein, carbohydrates, vitamins A, D, E, and K, calcium, niacin, phosphorus, magnesium, potassium, riboflavin, and sodium, as well as other minerals. Each of these nutrients makes an important contribution to your health. Consider protein, for example. Proteins are composed of amino acids, which build and maintain body tissues, fight off disease, transport oxygen in the blood, regulate blood sugar, aid in making the hormones that regulate our metabolism, and supply energy. The U.S. Recommended Daily Allowance of protein is your weight in pounds times 0.4 grams of protein. For example, if you weigh 150 pounds, you require 60 grams of protein a day. A cup of milk contains about 8 grams of protein. By drinking two cups of milk a day. plus daily servings of cereal, bread, dried-bean soup, and rice or another grain dish, you can easily meet your protein requirements. Although vegetarians are often accused of having protein-deficient diets, the fact is that many nonvegetarians ingest too much protein, causing a detrimental effect on their bodies. Dietician Nancy Clark, author of The Athlete’s Kitchen, says, “Americans eat two or three times as much protein as they need.” Pat Croce of the Philadelphia Inquirer says, “If more protein is eaten than required by our system’s needs, it simply turns into unwanted fat.” In addition, excess protein can result in an increased risk of dehydration, heat fatigue, and heat stroke, as well as cause diarrhea, gout, a loss of appetite, and a loss of calcium. Calcium, also found abundantly in milk, is not something one wants to lose. Calcium is required for the blood to clot and for the heart to function normally. And it protects the teeth by neutralizing the cavity-forming acids in foods. Also, today’s health-conscious woman knows that getting enough calcium throughout her life is important for protecting bone health. Women run a high risk of developing osteoporosis, a bone degeneration disease that afflicts up to 20 million Americans with a weakened skeletal structure (brittle bones) and is a leading cause of death among older women in the United States. The recommended daily allowance of calcium is 800 milligrams, but in 1986 the average calcium intake among women was only 650 milligrams—78 percent of the recommended amount. Proper milk intake could solve this problem, as one cup of milk contains about 300 milligrams of calcium. And besides curbing osteoporosis, calcium is also thought to lower high blood pressure and, according to some scientists, prevent cancer. Unfortunately, however, in the United States soft drinks are more popular than milk. In fact, soft drinks are more popular than water. A recent survey showed that over the eight-year period from 1977 to 1985 soft drink consumption increased from 6 to 10 ounces per person per day, and now stands at 401 cans per person per year. Researchers from the dairy industry, in an attempt to counteract this trend and put the fizz back into their sales, are working on a carbonated version of milk that won’t leave a mustache on your upper lip or a film on your tongue. “It’s a lot like club soda,” says Anthony Lukas, president of Dairy Research, Inc. “It’s very refreshing. Normally, milk coats the mouth, and people won’t drink it to quench their thirst. But carbonated milk doesn’t do that.” Lukas claims that his product, which will be available late this year, will have all the nutritional value of milk—at a little higher price. Even without the fizz, milk is relished by devotees of Lord Krsna both in the morning with breakfast and in the evening just before bed. Srila Prabhupada confirms that “there is a miracle in milk, for it contains all the necessary vitamins to sustain human physiological conditions.” But beyond that, he points out, there is also a quality in milk that is yet to be discovered by scientists in their laboratories. 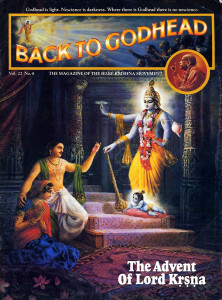 Describing milk as “liquid religiosity,” Prabhupada writes that it is effective for “maintaining the finer tissues of the brain for understanding higher aims of life.” In former ages great saints often subsisted only by drinking the one or two quarts of milk that householders would donate to them each day. So, milk is important for bodily maintenance and spiritual growth. If we can appreciate milk’s benefits, we will also appreciate the cows that deliver milk so generously. We can begin to view cows with affection, rather than as food. Lord Krsna Himself is fond of cows and calves, and as we develop affection for the cow and appreciation for her unique product, we will feel our minds becoming clearer and our hearts softer. 1. Wash the rice and set it aside to drain. In a tall pot that can hold at least twice the volume of the milk, bring the milk to a boil; then adjust the flame so the milk is always rising and frothing but not bubbling over. To minimize the cooking time, let the milk boil vigorously, uncovered, for the first 15 minutes while you stir it rhythmically with a wooden spatula to prevent the thick milk on the bottom of the pot from scorching. 2. Drop the rice into the milk along with the bay leaves. Continue stirring. Keep over a medium flame and stir very carefully for another 20 minutes until the rice breaks up and rolls with the milk. By now the milk should be reduced to two thirds of its original volume. Stir in the sugar, almonds, and ground cardamom seeds. Cook for 5 more minutes and remove from the flame. Sweet rice should be only slightly thick when removed from the flame because it will thicken when refrigerated. Chill well—the colder the sweet rice, the better it tastes. For other classic flavors, replace the ground cardamom seeds with a teaspoon of rose water and a few pinches of saffron powder, or season with bay leaves only and add a tiny pinch of natural camphor at the end of cooking. Offer to Krsna. 1. Bring the milk to a boil; then simmer. In another saucepan melt the butter and quickly fry the cloves and half of the ground cardamom. Add the vermicelli. Stir-fry until it is lightly browned. Pour the milk into the saucepan and boil over a medium flame for 5 minutes, stirring often. Stir in the sugar and the nuts. Lower the heat. Cook for 15 minutes (stirring every few minutes to prevent scorching) or as long as needed to allow the mixture to thicken slightly. Remember that it will continue to thicken after it is removed from the flame. 2. Take the saucepan off the flame, fold in the cream, and add the rose water. Pour the khir sevian into a dish, top with the remaining ground cardamom, and offer to Krsna hot or cold. 1. Turn the panir onto a work surface and crumble it. Using a pushing motion, knead it vigorously with the heels of your hands until it becomes smooth and your hands feel greasy. Now break off walnut-size pieces and form them into balls that are perfectly smooth and round, without any cracks. 3. Mix 2 cups of water with l½ cups of sugar in a saucepan. Boil for 15 minutes, and then add a cup of water. Lower the flame to simmering and put the cheese balls into the syrup. Cover the saucepan to keep the syrup at a gently rolling boil. After 10 minutes, remove the cover. Then cook the cheese balls about 10 minutes more. They will swell to almost double their original size. 4. To see whether the cheese balls are done, tap one with your finger. If it feels soft, they are ready. Remove them from the flame, take them out of the syrup, and put them into the milk to soak for at least 30 minutes. Then remove them from the milk and put them aside. 5. Cook the milk over a high flame, stirring continuously, until it reduces to two thirds of its original volume. Add the cream and the remaining syrup, bring to a boil, and pour the mixture over the cheese balls. Sprinkle with the almond essence and ground nuts. Offer to Krsna warm or chilled. Either bring the milk to a boil three times, being careful that it doesn’t spill over, or maintain a gentle rolling boil for 5 minutes. Remove from the flame, add the sweetener, and stir until it dissolves. You may also flavor the milk by adding one of the following: (1) 3 or 4 bruised cardamom pods, (2) a drop or two of rose water, (3) 1 table-spoon of chicory or carob powder, (4) a big pinch of ground nutmeg or cinnamon, (5) or a few strands of saffron. 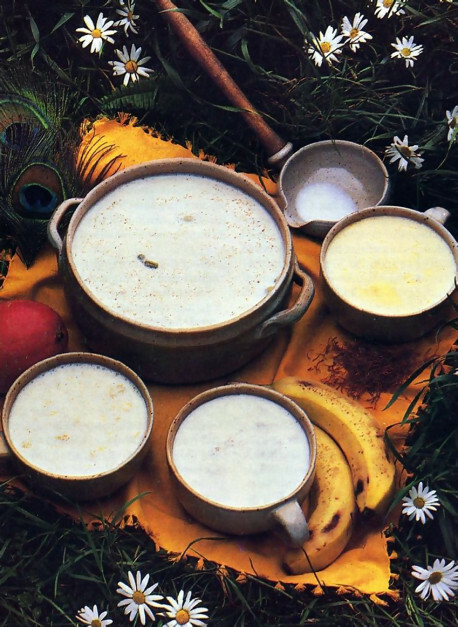 Hot milk with banana and mango makes a wonderful nectar drink. Crush a ripe banana or mango into a pulp and mix into the sweetened hot milk. Add 1 tablespoon of butter, ¼ teaspoon of ground cinnamon, and ¼ teaspoon of ground nutmeg. For any type of hot milk, pour the milk from one cup to another several times. This cools it slightly and aerates it. Then offer it to Krsna.